Local Locksmith Kitchener – Waterloo, Your search for the most trusted Local Locksmith Kitchener – Waterloo Services stops right here. Yes, you’re not just looking for the best. You’re looking for the most trusted. While most of our clients are saying that we’re the best, we’re more proud of the fact that they’re calling us the most trusted. We understand that locksmiths should be trustworthy professionals and we’re proud to say that people have been contacting us because they know that at Local Locksmith Kitchener – Waterloo we can be trusted. We are your Local Locksmith In K-W.
It’s important that you contact a Local Locksmith Kitchener – Waterloo. This is especially true since there’s a good chance that you need emergency services. While we’re offering services that can be on a by-appointment setup, we’re also offering services that require immediate attention, like if you locked yourself out. In these cases, can you really afford to wait for half a day for a non-local company to arrive? Besides, it’s always a good idea to support local companies in order to support the local economy. We are proud to be a Local Locksmith Kitchener – Waterloo. We are locally owned and we are operating locally. We’re here to make sure that peoples homes, businesses and automobiles in K-W and surrounding areas are secured and protected. Of course, it goes without saying that you want to secure your home and you want the most trusted locksmith to do it for you. We have you covered. We’ll ensure that you’ll have peace of mind with our important residential locksmith Kitchener services. We’d like to start by making sure that your home has high quality locks. We can do this in several ways. We can install high security locks for your home. We can also replace lower quality locks with better ones. If you have high quality locks that require repair, we can also do that for you. Again, we’re a full service Local Locksmith Kitchener – Waterloo. These are just some of our services but you can already see how we can help you handle all your lock needs and requirements. Commercial establishments require a lot of locks. That’s understandable. This means that they require our services and expertise. We’re trusted by the best companies in the area. If you’re a company looking for locksmith services for your commercial establishment, you need to check out our commercial locksmith Kitchener services. We can start by installing high security locks in your establishment. This is a must because there are a lot of important things that you need to secure in your establishment like expensive office equipment. We can also change and re-key locks. If you need to repair some locks, we can also do that for you. Did you lock yourself out of the car? Did the key break off in the ignition? You don’t have to worry because we’re a call away. We can also open a locked trunk. We’re also the company to call if you need to have your car key duplicated. Yes, even if it has the latest security features. We can even make you a new ignition key. Make sure to keep our number on speed dial for your emergency automotive locksmith K-W needs. We take pride in operating 24/7. We don’t take a break because we recognize that our customers need us to be available 24/7. Did you come home at 2 am from a party and you realized that you lost your keys? Contact us and you’ll be inside your room to get that much needed rest in no time. Is the lock to the file cabinet broken and an important meeting is happening in a couple of hours? Contact Local Locksmith Kitchener – Waterloo and we’ll have that open and replaced for you in no time. Did you lock yourself out of your car on a grocery trip? We’ve been opening locked cars in an emergency situation for a very long time now. Why Should You Trust Local Locksmith Kitchener – Waterloo? 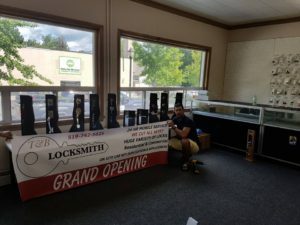 At Local Locksmith Kitchener – Waterloo we are fully licensed to operate as a locksmith company in K-W.
A lot of companies claim to be fully licensed. However, you need to check if they’re licensed to offer locksmith services in the K-W area. For all you know, they’re a licensed company but for a different service and a different city. We are a bonded company. Local Locksmith Kitchener – Waterloo stand behind all our statements, promises and guarantees. We’re a company of actions, and not just words. At Local Locksmith Kitchener – Waterloo we are proud to say that we’re a bonded company. Let’s face it. There are a lot of shady characters in this industry and we’d like to separate our company from them by becoming bonded. While we’re confident in our work, we’d like to offer you another level of protection as far as our workmanship is concerned. You can deal with us with confidence based on the fact that we’re a bonded company. Being insured is another form of protection that we’d like to extend to our customers. It doesn’t matter if you’re going to deal with Local Locksmith Kitchener – Waterloo for our residential locksmith services or commercial locksmith services. It doesn’t even matter if you need us for our automotive locksmith services. We’re an insured company and this means that both you and our company are protected.